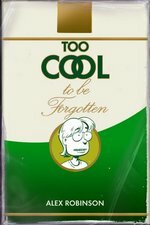 Movie news: TOO COOL TO BE FORGOTTEN announces writing team! News | Movie news: TOO COOL TO BE FORGOTTEN announces writing team! The film adaptation of Alex Robinson's award-winning graphic novel TOO COOL TO BE FORGOTTEN takes another step closer to reality this week, as screenwriters Rocky Russo and Jeremy Sosenko have signed on to write the script. Red Crown Productions' Daniela Taplin Lundberg and Daniel Crown are producing with Likely Story’s Anthony Bregman. Stefanie Azpiazu and Riva Marker will be executive producers on the film. Bregman commented "Too Cool To Be Forgotten is a story that demonstrates that comic books can be as profound and moving as they can be funny and entertaining, and that is exactly what this team hopes to replicate on the screen." "I'm awfully proud of this book, and pleased to see it in good hands," said Alex Robinson. "There's still a long way to go yet, so we'll hold off on the champagne just yet... but I may have a candy cigarette or two! In the meantime, back to work on my new book, which I'll hopefully have wrapped up by the time of the big premiere!" TOO COOL TO BE FORGOTTEN, Alex Robinson's third graphic novel (following BOX OFFICE POISON and TRICKED), follows middle-aged Andy Wicks as he attempts hypnotherapy to cure his smoking addiction... and finds himself traveling back in time to his painfully awkward high school years! Is he doomed to relive the mistakes of his past, or is this is second chance to get things right? If you've never read TOO COOL, check it out now and beat the rush!